See my full review and tutorials for settings and features. 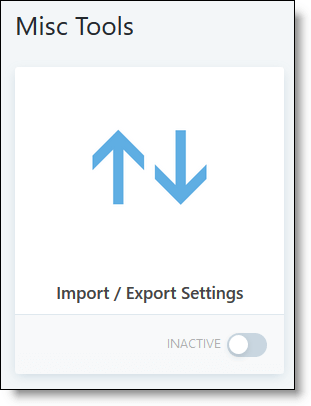 TIP: If you are switching from another premium social share plugin, Social Pug offers an Import/Export tool. 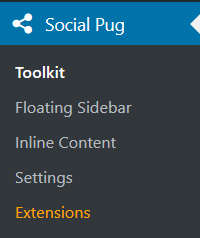 You’ll find it under the Social Pug >Toolkit link in the admin sidebar. See this documentation for Social Warfare migration. And here’s another tutorial from NerdPress. If you have any issues with the transfer, contact Social Pug support. We all want more eyeballs on our content. And a social share button plugin is a great way to help our fans share our content with their peeps. But, site speed is just as important. Why get new visitors if they just leave before seeing anything because your site is so slow? That’s why I did a super deep case study on the best free and paid social share button plugins. 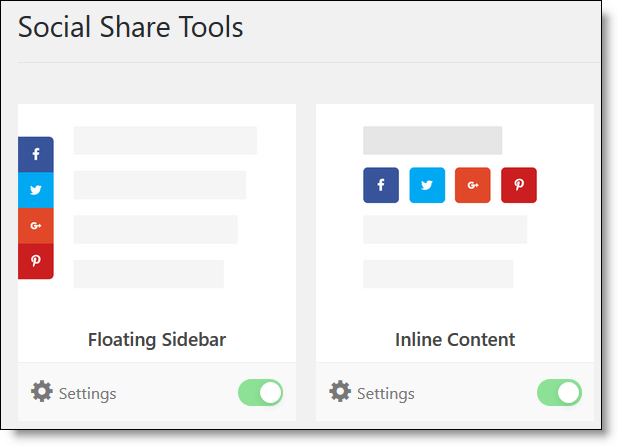 Social Pug was in the top 3 free social share button plugins. And it was my #1 recommendation for paid social share button plugins. 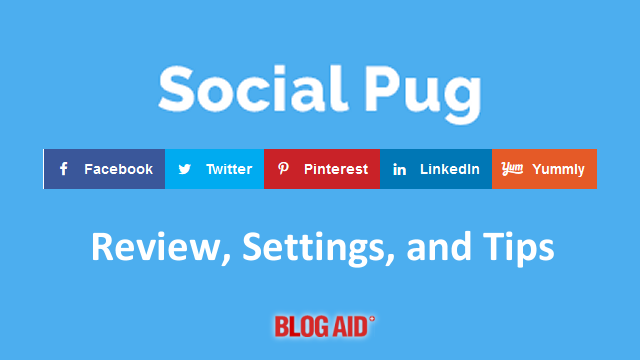 For sharing, Social Pug offers more social networks than any other plugin. Establishing yourself on an emerging platform can mean way more eyeballs/followers in the long run. Social Pug has those new platform buttons. Social Pug premium version also offers more integrations than any other plugin. 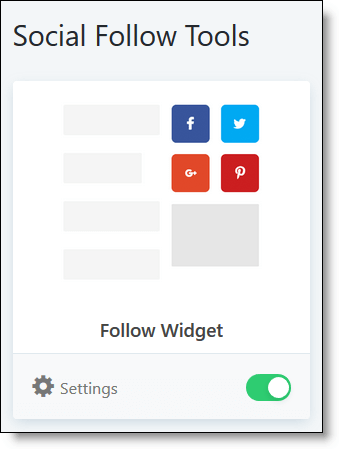 Social Follow – any of the plugins that provide a widget with follow icons. And that means a faster site!!! 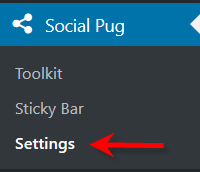 Below you’ll see screenshots and tips for configuring and using all of the features in Social Pug. I start with the free version, followed by all the wonderful features in the paid version. See how to install and configure the free version of the plugin. Clicking on the Go to Plugin button above takes you to the Toolkit. You’ll find these, and all other setting links in the left admin sidebar. The Toolkit consists of modules to turn on/off the various features you want to use. TIP: The available links in the admin sidebar will change depending on what options you turn on here. So, if you turn off Floating Sidebar, that link will disappear from the admin sidebar. Each option also has a Settings gear icon at the bottom of it to configure the settings for looks. This option allows you to place a row of buttons either above or below your content, or both. The paid version has the sticky option that remains at the bottom during scroll. The default Social Networks shown are the top 3. You can add more by clicking the Select Networks button the right. You can also reorder their position by click/drag the tab to the left of each one. Google+ which, of course, is now defunct. The paid version has many more (see below). You have a lot of choices with the look of the buttons!! And wait until you see the options in the paid version! TIP: I would delete the Share text (Sharing is caring) or at least change it to something more original. This looks at LOT like the text in one of the evil social share plugins. You have options for the Button Share Counts too. TIP: Displaying counts is a real drag on your page load time, none are accurate, and new case studies show they no longer encourage more sharing. Seriously consider dropping those vanity numbers and turning them off. 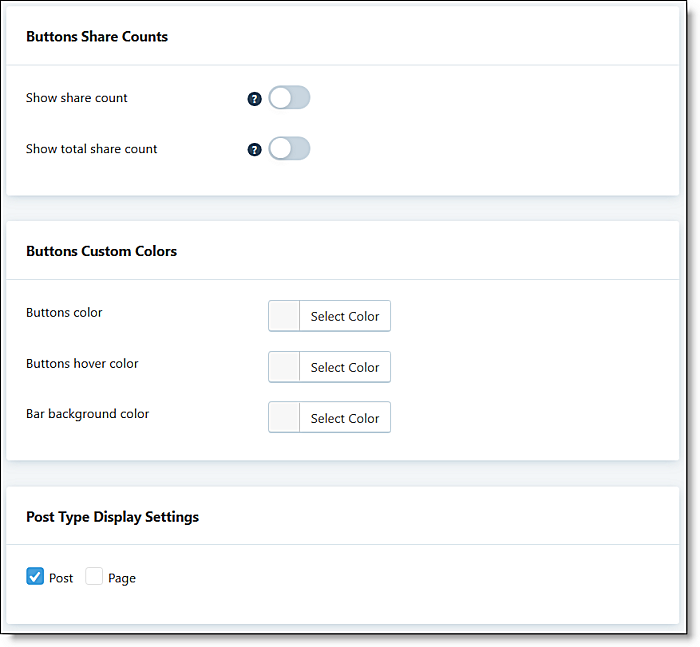 And finally, you have the choice to display the share buttons globally on posts and/or pages. 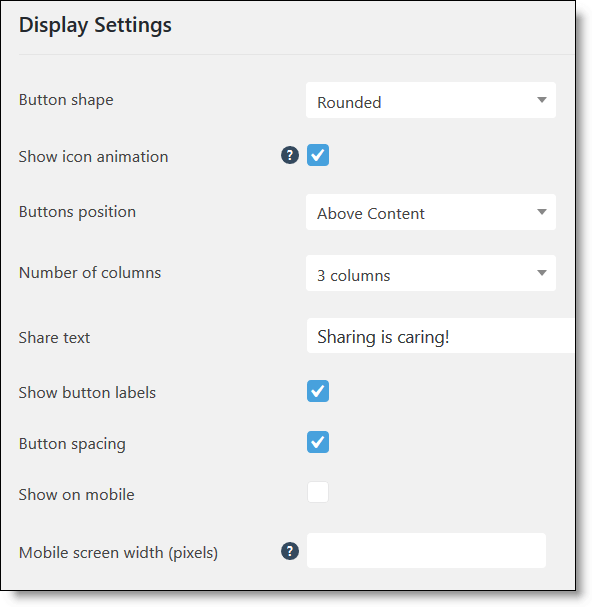 This option allows the share icons to float along the side of the content area as the site visitor scrolls. TIP: While this may seem like a cool idea to use, I really don’t care for floating sidebar share buttons, as they tend to cover up the content I’m trying to read when using both my cell phone and tablet. Please consider your user experience when deciding whether to use this option or not. The settings for this option are nearly identical to the Inline Content Settings, except that you can’t edit the label and there is no icon animation option. 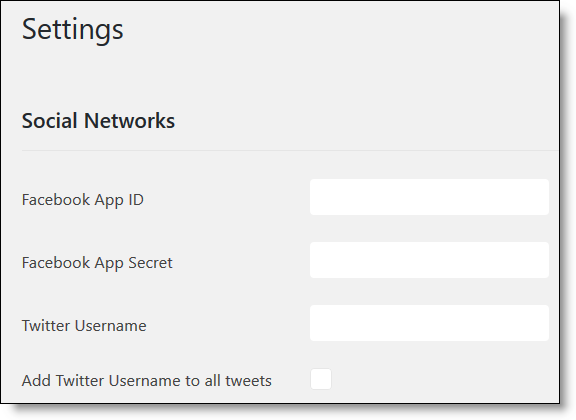 The Settings link in Social Pug free version has your Social Network IDs. TIP: The only one you may need to fill in is the Twitter username so that when folks share with the Twitter button, the tweet will also include your Twitter handle. 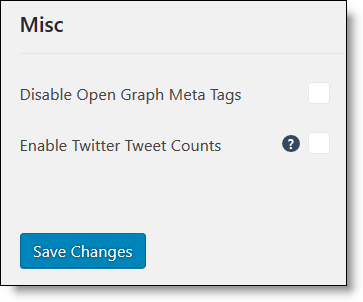 There’s also a Misc section where you can turn off the Open Graph (OG tags). There’s also a spot to turn off Tweet Counts, and I would, as none of the 3rd party services that provide the counts are working well anymore and/or cause a huge drag on your site’s load time. You only need to turn these off if you elected to show counts. One of the beauties of Social Pug is that you don’t need to run the free version and the paid version. Follow the plugin’s installation directions for how to make the switch to only the paid version. TIP: Unlike the free version, there are no default Social Networks. You will need to select them for each set of buttons you choose to display. The paid version gives you more Social Network choices than any other plugin. Even though you are at first taken to the Toolkit, let’s start with the Settings tab. You’ll find it in the left admin sidebar under the Social Pug tab. The Settings page is split into multiple tabs at the top. Serial key to register your premium version. Fields to enter your Username for all of the social networks for which you intend to include a social follow button. TIP: You only need to fill these in if you are also using the Social Follow option in Toolkit, which we cover below. 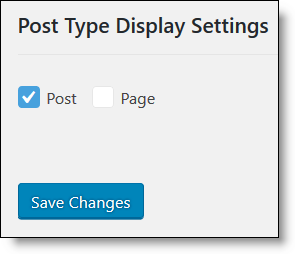 Styling options for the box that appears in your post/page. Pinterest Settings – we’ll cover these below in the Image Hover Pinterest Button settings. Return to the Toolkit link in the admin sidebar. The paid version gives you several more options for displaying the share buttons. The Sticky Bar option floats at the bottom of the screen as visitors scroll. TIP: This is the favored way of displaying on both desktop and mobile. And, you can select to only show the Sticky Bar icons on mobile and show the Inline Content buttons on desktop!!! Select the Social Networks you would like to display on the Sticky Bar. TIP: Keep in mind that you may not want to show as many on mobile as desktop. In the Display Settings you have the opportunity to select your style choices, and where to display the Sticky Bar. You also have animation choices, which gives a visual indication to the visitor that they clicked one of the buttons. 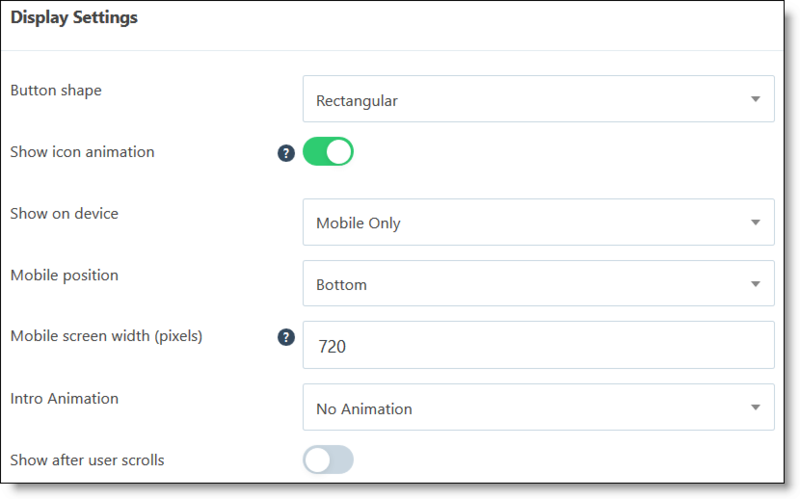 Also note the Show after user scrolls option, which delays the appearance of the buttons until after a visitor is engaged with your content and scrolling for more. This makes for a super clean initial load of your content!! Following are the rest of the settings for the Sticky Bar. You can drop your other Pinterst hover button plugin now. Social Pug has you covered!!! You’ll land on the Settings > Pinterest Settings tab. There is a module for the general settings and one specifically for the hover button. I’m very excited about this option as it will allow you to drop your current social follow widget plugin. Select the Social Networks for the platforms where you are active, so visitors can follow you there. You have an array of button styles. Below that are two modules for more styling options. 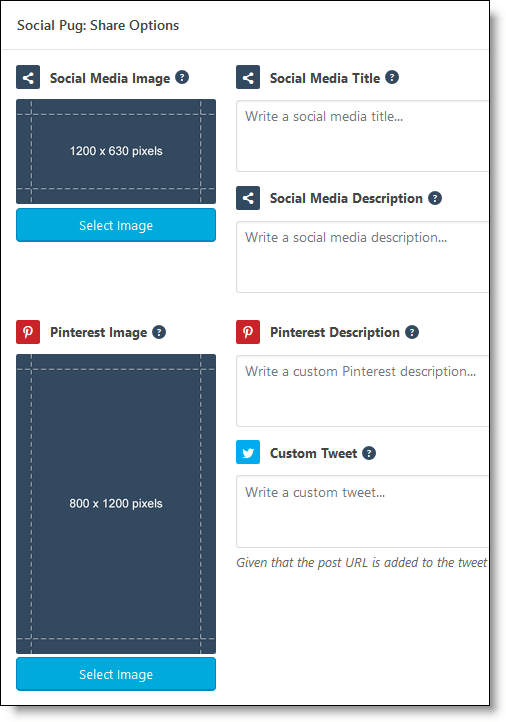 If you’re switching from another premium social share plugin, you’ll most definitely want to take advantage of this import/export tool to bring all of your custom image/description info over. See this documentation for doing the migration from Social Warfare. 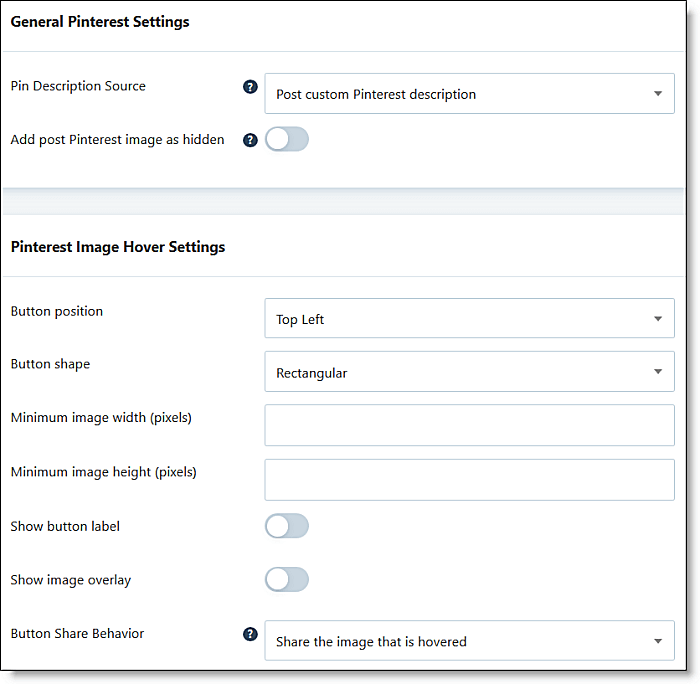 Below your post/page text editor, you’ll find a module to assign a custom Social Media Image/Title/Description and a custom Pinterest Image/Description. These come into play whenever a visitor clicks the share buttons. The Social Media set will be wrapped in OG tags which are picked up by Facebook. It will also assign them to the Twitter Cards. The Pinterest set is wrapped in specific Pinterest-only tags. Scroll down to see more display options for those images, plus stats, and count recovery status. Images uploaded to the site can also be assigned a specific Pinterest Description, including hashtags. 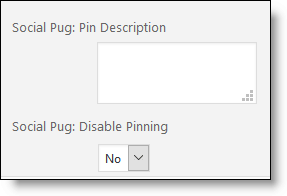 And, each image can be assigned a no-pin option. These are the same functions that the Tasty Pins plugin provides, so you can drop that plugin now too. TIP: I tested deleting Tasty Pins and all custom Descriptions and no-pin code remained on the site. What do you think of Social Pug? I think it’s the cat’s meow and highly recommend it, especially for any site owner who needs all of the extra Pinterest features. Thank you! 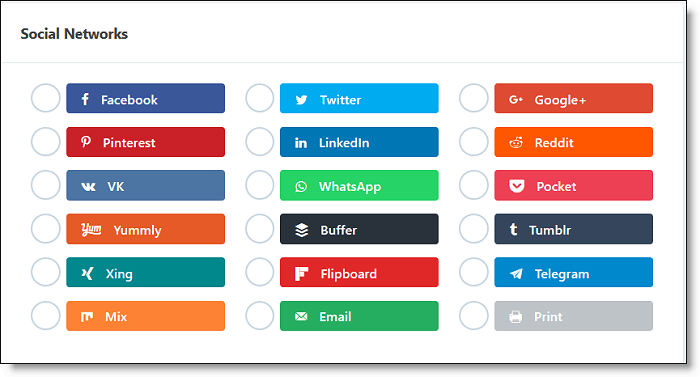 I’ve already added the free version of Social Pug plugin to a couple of sites–painless and fast to do. Great tutorial and review. Yay!!! Glad it was so easy for you. Thank you MaAnna for the deep testing of the social share options. I have been waiting to be able to use Yummly. It was my third top source of traffic and I really look forward to that traffic! I am glad you included all the settings. I am certain I would have had more questions on those. And this change over is so timesl. My Tasty Pins is due April 1st. Yeah, Social Pug has got it all and betting a LOT of foodie bloggers and heavy Pinterest users are going to love it.